Extreme Microbial Technologies has introduced the Puradigm PRO™ unit for specific application to improve the air environment and to suppress pathogens in egg packing plants and hatcheries. The unit incorporates a broad spectrum, high-efficiency, dual-wave length UV- X lamp emitting at 253 and 185 nm. A unique honeycomb matrix is used to maximize surface exposure available to promote photocatalysis. The efficiency of the UV-X lamp is enhanced by a hydrophobic coating that promotes the release of bactericidal reactive oxygen ions. The ultraviolet light emitted by the Puradigm PRO™ forms plasma in the atmosphere of the environment of a plant enhancing air quality since the clouds of ions are capable of destruction of bioaerosols that include suspended bacteria and fungi. Air quality is maintained by sensors placed in air ducts which monitor the presence of volatile organic compounds and particulate matter. Measurements of specific fractions of particulate matter are integrated into the control of the air purification system. Generation of cluster ions formed by the photocatalytic generator effectively reduce the viability of a wide range of potential pathogens including Bacillus, Enterococcus, Listeria, Salmonella an, Pseudomonas. 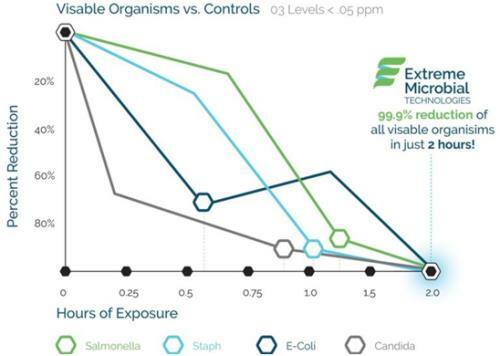 Laboratory and field evaluations have demonstrated that the units installed by Extreme Microbial Technologies will reduce bacteria and molds spores in the air and on surfaces by up to 97 percent. Extreme Microbial Technologies units can be installed in the ducts of heating and air conditioning systems or can function as free-standing units. Initially when designing an installation to reduce airborne contamination an electronic BioAerosol monitoring system is deployed. The instrument measures particle size and induces ultraviolet florescence in particles including bacteria to quantify the level of contamination. Compared with conventional swabs and agar plates, the BioAerosol monitoring system provides real-time quantification of bacterial contamination and can monitor the efficiency of purification systems. The systems approach applied by Extreme Microbial Technologies involves identifying and quantifying the types and levels of bacterial contamination. 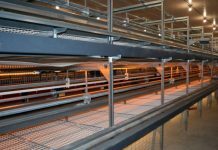 The Company then selects and installs units to reduce the levels of bacteria and fungi in the atmosphere. Regular monitoring of levels of contamination is continued to assess the efficacy of cleaning and to detect the emergence of novel pathogens introduced into the environment of a plant. 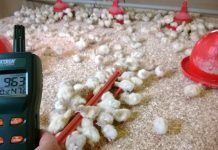 The system has been installed in a number of egg packing plants to reduce the possibility of contamination of product providing an additional level of security against the possibility of trace-back from Salmonella outbreaks. Further information can be obtained from Extreme Microbial Technologies www.extrememicrobial.com or (844) 885-0088.